Stack monsters to the moon! Help these adorable monsters work together by stacking them on top of each other to get higher than they've ever dreamed! One-touch controls will keep you coming back for more spooky fun time after time.. Fully animated characters will crack you up as they moan, rattle, and roar while you stack em' up. 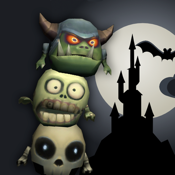 3D Graphics create a playfully spooky world that children of all ages will love. High Score board keeps track of your beat performance and your highest towers! + Tap the screen to drop the monster! + Simple, fun, and addictive gameplay! + Cute 3D cartoon art! + Tons of animations and SFX!